American Gothic is one of the most famous paintings in America. Editorial credit: Scott Cornell / Shutterstock.com. The house that was used as the backdrop from the American Gothic painting. American Gothic is often quoted as one of the most famous paintings of America and has become enshrined in the country's popular culture. The painting solidified Grant Wood's legacy and has been the subject of various interpretations since it was first exhibited. American Gothic is one of the most renowned works of Grant Wood who spent his childhood in Iowa. After receiving art instruction in the Handicraft Guild situated in Minneapolis, Wood made his way back to Iowa where he engaged in teaching in a one-roomed schoolhouse. Wood was trained at the School of Art of the Institute of Chicago before embarking on four European trips from 1922 to 1928. While in Europe, Wood studied various painting styles including Impressionist style as well as Post-Impressionism. He was particularly impressed by the artistic works of Jan van Eyck who was a Flemish artist. Wood established himself not only as a painter but as a skilled artist in other medias such as ink, wood, charcoal, lithography, and ceramics. Between 1934 and 1941, Wood was an instructor in painting in the School of Art at the University of Iowa. He is prominently associated with Regionalism which is an American artistic movement featuring rural American themes. Grant Wood derived the inspiration for painting from the Dibble House situated in Iowa. 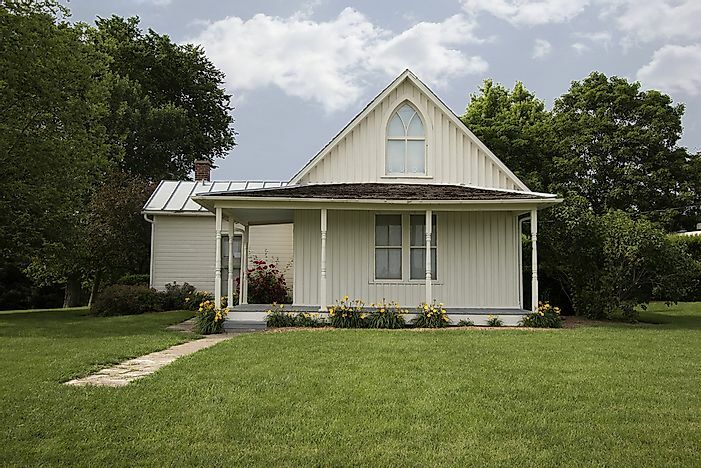 The house was white, and it had been constructed in the Carpenter Gothic style of architecture featuring a unique upper window. Wood proceeded to make the first sketch and upon obtaining permission from the inhabitants sketched it the following day in oil and paperboard. He painted the house with a longer window, a steeper roof in addition to a more pronounced ogive. Wood used his dentist and his sister as the models for the painting's figures. The woman figure is draped in a colonial print apron styled in the 19th century Americana. The male figure is depicted holding a pitchfork. Both figures sport long, stoic faces that go with the vertical associated with the Gothic architectural style. Wood also added plants on the house's porch which are identified as the snake plant and the beefsteak begonia. Wood finalized his work on the painting in 1930, after which he submitted it for a competition arranged by the Art Institute of Chicago. It was awarded a bronze medal together with a cash prize of $300 by the jury on persuasion by a museum patron. The institute also bought the piece where it remains as part of its collection. The painting has been exhibited twice outside the US, first at the Musée de l'Orangerie situated in Paris from October 15, 2016, to January 30, 2017. The artwork was also showcased at the Royal Academy of Arts located in London from February 25 to June 4, 2017. American Gothic has achieved the status of an iconic artpiece at par with other renowned images such as the Mona Lisa. The painting has been extensively used and satirized for cartoons as well as advertisements. American Gothic received its fair share of criticism initially, but it was interpreted as representing the strong American pioneer spirit during the Great Depression. The painting is frequently parodied in television shows, film, as well as marketing campaigns.